Hello there, stupid question here - i get what the lines in the middle of the chart represent, but are the lines at the bottom precipitation? If so, how do you quantify it because the scale up the side is in degrees. Am I missing something here? how do you quantify it because the scale up the side is in degrees. Sorry to be stupid, but where do i get the GFS charts with the temperature lines running horizontally, and the precipitation underneath, as i followed the instructions earlier on in the topic, but could only get other charts. Thanks! Markus, which instructions were you following (there's a few posts up there) and what chart were you after (eg the Genf "general" chart, or one for a specific place)? Then select "GFS 1° + GFS Ens: Europa" from the menu upper middle, then "Genf" and "Ensemble t850 und Nds" and click "Zeigen". This will get you the chart for Geneva. For a specific Lat/Long plug the figures into this URL: http://85.214.49.20/wz/pics/MS_XYY_ens.png (where X=Longitude & YY=Latitude). It does it in 1 degree intervals. One final question, where can i find out the lat/long for Zell am Ziller (not Zell am See)? Thanks! Markus, try wikipedia. If that doesn't have it, I can only suggest Google maps or Multimap or an internet search. It is linked from Wetterzentrale, but easily missed. It shows charts from various runs for specified days/times and allows you to quickly compare differences. skanky, perhaps you can help me. Despite a ski trip to come, my thoughts at this time of year turn to summer (as in July when I was thinking of skiing!) if only to sort out flights. Our destination is Palma, Majorca and we'll be at sea level! It would be good to monitor expected temperatures and rainfall. What might be the the ensemble chart for this location and criteria?! To get sea-level temperature add about 10 degrees. brian, thanks for this. 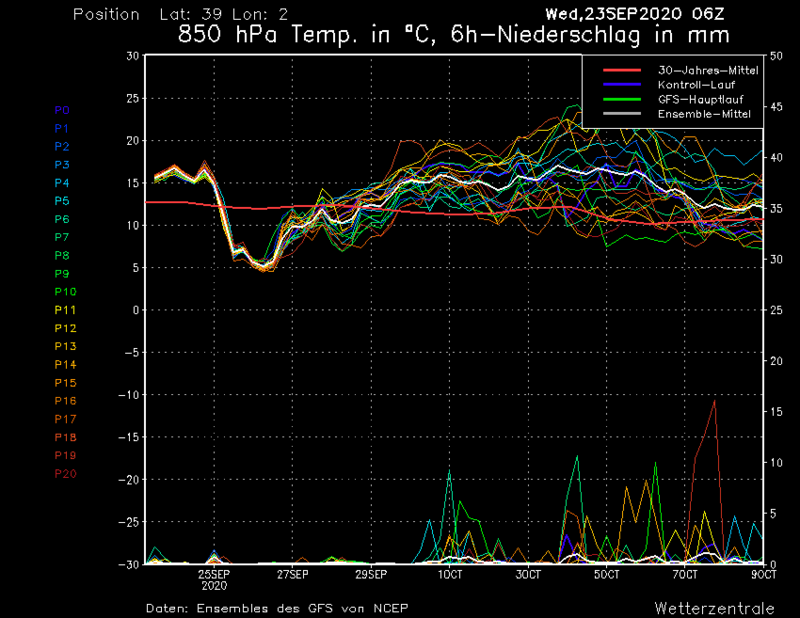 I had understood that 850 hPa was the equivalent of a reading at about 1500m, depending on pressure conditions. Is there a sea level equivalent? They do do their control run 2m chart, but it is only the control run. Take the GFS 2m temps with a huge pinch of salt as it can be out by a few degrees in various conditions. Can someone explain what it is about GFS which leads snow-forecast.com to tell me that the maximum temperature at 1611m in Notre Dame de Bellecombe tonight will be -5, but that freezing level will be well above 2000m? pam w, a temperature inversion. So normally you expect the temperature to drop as you go up in altitude, because the air pressure drops. However, in still conditions with no wind to mix the air around, cold air can sink into valleys and become trapped under an area of warmer air at a higher altitude. It's what creates the "above the clouds" conditions in the mountains. brian, thanks. I understand normal inversion (drove down into the valley yesterday morning, plus 7 up here, minus 3 down there). What I don't understand is that on a night when the freezing level is shown as 2050m (e.g. next Friday, Notre Dame de Bellecombe 1611m) the MAX temperature at 1600m is shown as being minus 3. Does that mean that, on a night such as that, the freezing level is expressed as the altitude below which it will freeze, so that our snow cannons are running at 1600m all night but at 2500 the snow is melting? Seems intuitively unlikely, though I recognise that intuition may not help here. pam w, you'll still have normal cooling with altitude above the inversion layer, so it might be something like freezing below 1800m, then a warmer layer just above freezing and then freezing again above 2050m. Whats the difference between the 500hPA Bodendruck and the 850hPA Temperature ? Smokin Joe, Bodendruck is surface level pressure. - the surface level pressure in lines (these are the isobars you'd be familiar with from tv forecasts although they've largely dumbed them out these days). - the height (in decametres, ie. 136 = 1360m) of the 850 hPa pressure level in lines. - the temperature at 850hPa in colour. The charts are generated using the GFS 0z and GFS 12z operational runs and show dew point, wet bulb temps, precipitation rates and 2m temps. The charts go out to t+180 hours and are stepped at 3 hour intervals. 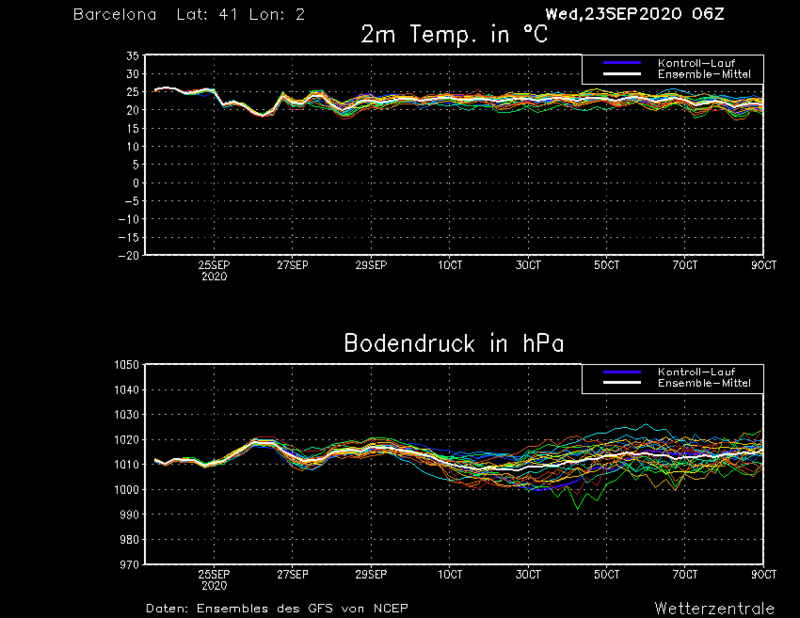 In addition the regular forecasts going out to t+384 hours continue to be freely available for alpine resorts. On this chart, http://85.214.49.20/wz/pics/MT8_Genf_ens.png, how granular are the divisions on the time axis? is it 6 hourly or 3 hourly (4 or 8 divisions per day)? On this chart, http://85.214.49.20/wz/pics/MT8_Genf_ens.png , how granular are the divisions on the time axis? is it 6 hourly or 3 hourly (4 or 8 divisions per day)? What up, nutz! Having removed the comma at the end of the URL so that your link works, it looks to me like 12 divisions per 48 hour period, which is one every 4 hours or 6 per day. elvis, I would have thought that it would divide at 3 hour or 6 hour intervals given the main GFS forecasts run at 3 hours for the Mitteleuropa and 6 hours for Europa. Surely it's all based on the same data? I know there's 12 dots across each square but the points don't all line up with each dot. Thanks so much for pointing out the prob with the comma - I'll be more careful in future. What's the title of the thread again? The datasets are available in 6 hour steps from NOAA. I'm not sure whether Wetterzentrale download them all. We dowload them in 12 hour steps currently. the Hauptlauf (high run in german I think) is the operational run (ie. the one you actually see on the charts). Prior to March last year, it used to appear as the thick blue line, but GFS was then upgraded to run at a higher resolution (on a 0.5 degree grid rather than 1 degree). However, I think it's only the operational that runs at the higher res (hence hauptlauf) whereas the rest of the ensemble members are at the old 1 degree resolution. When this change came in the operational went missing from the ensemble charts. It looks like Wetterzentrale have got round to putting it back. btw, the thick blue line now shows as "control run", I think that it's what was the old operational run (ie. the input unmodified but at the coarser resolution) but I'm not 100% sure of that. The starting conditions for the operational run are considered to be those which most closely model the current state of the atmosphere. If you need to make a deterministic forecast using the GFS it is best IMHO to use the operational run to do so. The ensembles should be used to gauge the level of confidence in the forecast. In other words, if most of the ensemble members support the operational run, confidence in the solution is increased. Hornster, it only covers Europe, 25 W to 40 E and 30 N to 70 N.
Brian, do you know any websites that cover that part of the world? brian, I have managed to plug in the coordinates on the NOAA link above and have selected the 180h option, typed in the password and got the 4 or 5 graphs but how do I get the GFS graph with temperature and precipitaion ensembles all on the one graph? there seems to be a little difference of opinion on the blue line. kittenski has quoted a post saying the thick blue line (kontrol lauf) is essentialy an older courser model output, seemingly for comparison purposes with the new hi-resolution output from some newer software or input - the green line. metalhead's post suggests the thick blue line is the most likely run - as used in forecasts. From what i can tell - it is the thick green line which is used in the runs. When it peaks you get snow on the weather web sites!